​﻿Order through Amazon or here! We are also in FIVE stores around Jacksonville, FL. Click on the STORE tab to order online. Ever need to cover the bed of your pickup? Hard and soft permanent covers are too expensive and large items - like that sofa - won't fit! The most common non-permanent covers on the market today are blue tarps, which are hard to use, flap in the wind, and rarely keep your goods dry. No matter how many bungee cords you use, it is never easy to get a tight fit. We've invented a one-time use, flexible, and weather-resistant cover that adheres to the truck without leaving any residue! This inexpensive option protects your goods and is easy to use. Patent Pending. Our Bedder Covers are better! Any size truck. Any size load. Stay connected with us to find out what's happening. You can sign up for our newsletter in the sidebar. We will only mail you once a month or less to let you know what changes are happening. Or, you can come like us on Facebook and follow us on Instagram to stay up-to-date on special offers! Check out our sister product: ​Big Tape! Big Tape is a big piece of tape that will temporarily cover a broken car window. It sticks to the car's sides but unlike duct tape, it leaves no residue! 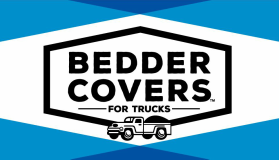 Like Bedder Covers, it withstands highway speeds and won't allow dirt or water to enter. Check it out HERE.